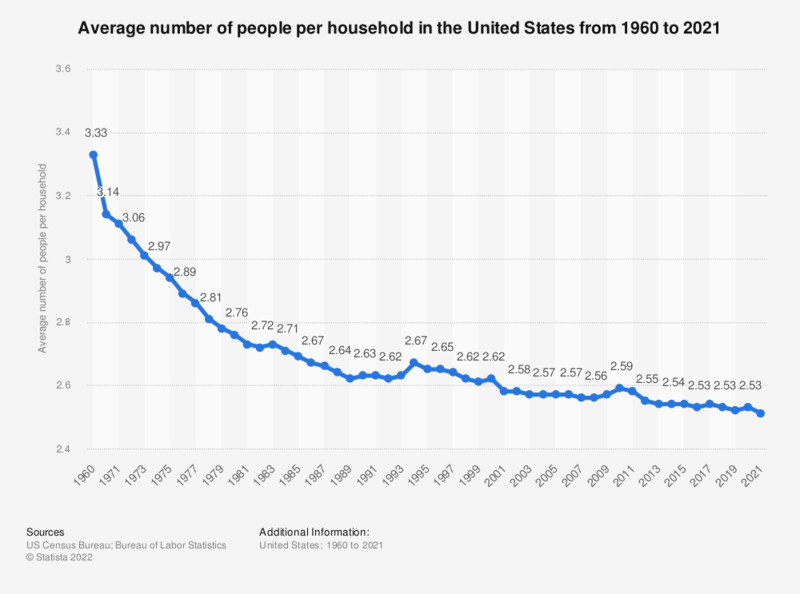 This graph shows the number of people per household in the U.S. from 1960 to 2018. The average American household consisted of 2.53 people in 2018. As shown in the statistic above, the number of people per household has decreased over the past decades. The population of the United States has been growing steadily for decades. Since 1960, the number of households more than doubled from 53 million to about 127 million households in 2018. Most of these households, about 34 percent, are two-person households. The distribution of U.S. households has changed over the years though. The percentage of single-person households has been on the rise since 1970 and made up the second largest proportion of households in the U.S. in 2018, at 28 percent. In concordance with the rise of single-person households, the percentage of family households with own children living in the household has declined since 1970 from 56 percent to 41 percent in 2017. Data from previous years can be found here. Everything On "Demographics of the U.S. Part II" in One Document: Edited and Divided into Handy Chapters. Including Detailed References. Statistics on "Demographics of the U.S. Part II"